UNBELIEVABLE!!!!!!! If the administration wants us to believe that they are doing everything in their power to protect us, then they have some explaining to do about this one. There are at least 22 active terror cells INSIDE the United States. This is a horrifying development. 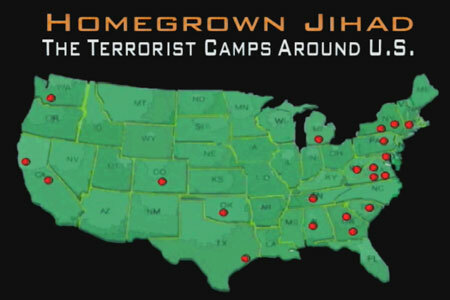 There are at least 22 active terror cells INSIDE the United States. This is according to an actual FBI map, not just some lunatic fringe, conspiracy theorist. Jamaat ul-Fuqra, which runs the camps, is an Islamic fundamentalist organization related to Al-Qaeda and the Muslim Brotherhood terrorist organizations. These are not brand-new camps either. Homeland Security has known about them for years. The reason DHS and the FBI have been unable to act against this very real threat inside our homeland is because the Obama Administration refuses to classify their parent organizations, Muslims of the Americas and Jamaat ul-Fuqra, as terrorist organizations. These cells have already been involved in several crimes, including at least 10 murders and multiple attempts at bombings. President Obama has done shockingly little to confront the Islamic State and international Islamic terrorist abroad. It is even more outrageous and indefensible that he is weak and failing to tackle the threat here at home. The number one duty of government is to protect the people from violence by foreign and domestic enemies. Obama is severely derelict in his duty.It makes absolutely no sense why, despite a mountain of evidence, nothing is being done to counter this vile threat from within our borders. These terrorists are especially dangerous against so-called “soft targets” like banks, schools, water treatment plants, and other places with relatively low security but where attacks could cause great damage. When you have terrorist training camps actively operating on US soil, one just 2 hours north of NYC (Islamburg in Hancock NY ), this should be front page news. Sadly this is not the only camp they have in operation on US soil. They pose a real threat to all Americas, and we need to make the administration accountable for their lack of action before it too late!